Breast feeding is a very complex task for the body to accomplish. There are 26 muscles involved in feeding. Often times because individuals diagnosed with Down syndrome have weaker muscle development, breast feeding can pose particular challenges. 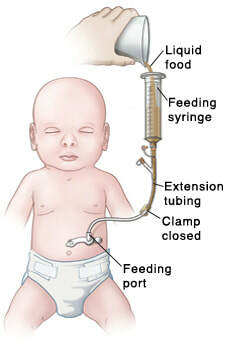 Below are some examples and an informative article on breast feeding aids. In transition a baby with Down syndrome from breast/bottle to solids, there are many tools that can aid in this sometimes challenging process. It is very important for the baby to sit up, and be positioned correctly when feeding/eating solids. This not only allows for proper muscle development/strengthening, but also encourages the baby to reach for food themselves. The chair below is an excellent option to encourage the child to sit up and the tray allows for him/her to practice reaching and grasping food. When utensils are introduced to older babies, a wide variety of tools exist that aid in a child with Down syndrome gripping the utensil. This website provides a tremendous amount assistive technology tools for children with different disabilities. Communication in any child is the ultimate gateway to understanding, connecting and aiding your child. Communication begins immediately for all children. Children with Down syndrome are encouraged early on to use signing (ASL) to aid in their communication. ​Below is a video detailing the different stages of communication and specifically the stages seen within children with Down syndrome. Down Syndrome International further explains the importance of communication and the development of it in children with Down syndrome. 1.1. The importance of learning to talk Learning to talk is central to all other aspects of early childhood development. It is very important for social and emotional development and for the development of intellectual abilities. Being able to talk allows children to gain control over their social and emotional world. Because we are human beings, we have to communicate with each other in a social sense. The reason for communication is to exchange information between two or more human beings. Talking means children can ask for what they want, share experiences, understand what is about to happen and express themselves when they are hurt or upset. In order for communication to take place the participants must both speak the same language. In other words, talking helps children to relate to others. Why do we need to communicate? When a child cannot communicate a parent can feel isolated and even rejected by the child. This can lead to problems in the relationship between parent and child. We need to form relationships with other people. In order to do this we need to talk about our feelings, our thoughts and to talk about things, events and actions as well as understand other people. When we communicate, we can get people to do things, we can make them react to us. Being able to communicate in the preschool enables children to play together, to share and to learn together. Throughout life communication underpins the development of friendships, supporting one another and negotiating our way through the world – shopping, travelling and working. 2. How do we communicate? We can do all of the above verbally i.e. talking, laughing, groaning, listening, or by using non-verbal communication i.e. making gestures, using body language, eye contact, or facial expressions, or written communication. Learning to talk is an everyday activity. Children will communicate because they want to. The human being is a social being above all else. All parents want their child to talk because most people around us talk. When we communicate this way, we have to learn to listen when someone else is talking and take turns to talk. Some children find this difficult. These children can be helped either by using a sign language e.g. The Makaton System, or use a communication board. Communicating through gestures leads to talking for many children. 3. How does the child develop language? • understand speech Receptive Language. Receptive language describes all the words, sounds, signs and body movements that a person understands. • Questioning by pointing as well as making a sound This is communicating and we must respond to it. 4. How can we help the child to communicate? It is very important to talk to the child all the time, even if the child does not talk back to you. Here is a list of things you can do to encourage the child to communicate. (Remember, communication should be fun and play time is the best time to teach language). • Expand on what the child says e.g. if the child says “Boy sit” you say, “The boy is sitting”. • Respond to the child immediately. This encourages the conversation. It shows that you are listening. • Follow the child’s lead in communicating – this keeps his interest and encourages more communication from him. • Repetition is very important. Repeat words and movements to your child. • Take turns to speak. Ask open-ended questions to keep the conversation going. Avoid giving orders. The use of questions, giving choices and explanations will lead to children who do the same. Is there a critical period for learning language? Apparently the brain is most ready for speech and language learning between birth and 6 to 8 years and the ability to learn language lessens after this. What should be understood is that there is no reason for speech and language skills to steadily progress into adult life. However, if some control over both grammar and speech production is not in place by six years of age, then the child may never attain the fully sophisticated control over these aspects that most of us take for granted. Some researchers suggest that the parts of the brain that would be used especially to control grammar and speech production would be used for something else if grammar does not develop. This fact emphasises the importance of early language intervention. Parents, therapists and teachers should therefore realise the importance of ensuring that children are exposed to both listening to and saying grammatically correct sentences by 5 years of age if possible. This can be done by reading to a child who is not yet able to use sentences. There is also evidence that a child needs to have a 300 word vocabulary before the learning of grammar can begin. If the above statement is true, then it is important to try and teach a language delayed child a 300 word vocabulary before the age of 5 or 6 years and probably earlier. Children with Down syndrome want to communicate. They do so effectively from the early years and use gestures to compensate for their difficulties with spoken language. • Children with Down syndrome find speech production difficult. They will benefit from therapy directed toward motor control of the tongue, mouth and vocal tract as well as exercises emphasising rhythm and pacing, awareness and control of starting and stopping gestures and sounds and of gradually or abruptly increasing and decreasing their speed and volume. • Children with down syndrome may find learning word meanings from sentences difficult and will be helped by extra opportunities to learn from language teaching games in which words can be learned one at a time. This will be particularly helpful for early vocabulary when it is mainly nouns and verbs that are being learned. Later specific teaching of early grammar and sentence meanings may also help to accelerate learning. • The anatomical differences associated with Down syndrome, (differences in skull shape, jaw, palate, dentition, tongue size relative to mouth and difficulties with motor skills development and fine motor control,) will all contribute to the greater difficulties that children with Down syndrome have in developing clear speech. Therapy aimed at increasing oral-motor control from infancy will help articulation but there is no evidence that surgery for tongue reduction improves speech. • The growth in verbal memory span during childhood is specifically delayed in children with Down syndrome. This affects the learning of words and grammar. There is some evidence that memory training can increase the short-term memory spans for these children. This increases the rate at which grammar is learned. The difficulties in hearing, auditory discrimination and working memory indicate that learning language from listening, the way most babies do, will be difficult for children with Down syndrome. Evidence suggests that parents should be encouraged to learn to use signs (e.g. with systems such as Makatonor Signalong) to support the development of spoken language with their baby from 7/8 months of age. Research shows that children with Down syndrome do not learn words from speech input alone and that those children who have been on sign supported therapy programmes have bigger spoken vocabularies at 5 years. Some parents have difficulty accepting this as they believe that the use of signs will delay speech development. Others fear that signing makes their child appear more ‘handicapped’. • Signs helped children to learn and understand words. • Signs are a bridge to speaking and should be needed less as children learn to talk. • The focus should always be on learning to say words with signs used as an aid. • All language targets can be taught with the aid of written material, even to children who are not able to remember the words and read independently. One of the greatest assistive technology tools that can be given to children with Down syndrome to aid in communication is speech/communication therapy. The National Down syndrome Society elaborates on the importance of speech/communication therapy as an assistive technology tool for children with Down syndrome. "Speech and language therapy is a critical component of early intervention. Even though babies with Down syndrome may not say their first words until 2 or 3 years of age, there are many pre-speech and pre-language skills that they must aquire before they can learn to form words. These include the ability to imitate and echo sounds; turn taking skills (learned through games like “peek-a-boo”); visual skills (looking at the speaker and objects); auditory skills (listening to music, speech, or speech sounds for lengthening periods of time); tactile skills (learning about touch, exploring objects in the mouth); oral motor skills (using the tongue, moving the lips); and cognitive skills (understanding object permanence and cause and effect relationships). Early Intervention is key in aiding children with Down syndrome. ​Below is a helpful article on the importance of Early Intervention and its benefits on communication.